actually that is the Chick-fil-A on Sancus Blvd… the Chick-fil-A on Polaris Parkway (in Polaris Fashion Place mall) still has a couple of hundred reservations available. E. Broad St. is out of luck as well. Grove City, Hilliard and Dublin (Tuttle Mall area) still have reservations available. The Spicy Chicken Sandwich goes on the Chick-fil-A menu in Columbus on June 7, 2010 according to their site. The photo is in Texas… not Ohio. 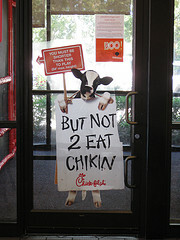 Thanks to maigrey for a Chikc-fil-A photo with a Creative Commons license. maigrey’s photostream I love the cows in Chick-fil-A’s ads.